There were 62 newspapers to deliver after school and neither rain, nor snow, nor sleet, nor dark of night would stop me from carrying the Alliance Review to each and every doorstep. At 8 years of age, I was the Review’s youngest paper carrier. I wore my yellow slicker and sloshed through soggy yards in bare feet. I was careful to place each newspaper inside storm doors to protect it from the rain. My grandparents’ home was the exact halfway point on my paper route making it the perfect pit stop for fueling up on snacks and soda. If I walked fast and didn’t stop to visit, I could complete the route in half an hour, but of course I never skipped Grandma’s house. Grandma leaned out her screen door waving and “you-hooing” me over. She wasn’t wearing a raincoat, but was sporting a plastic bonnet to protect her just-home-from-the beauty-shop-curls. Despite the rain Grandma remained at her post gesturing wildly like an airplane flagger guiding me safely into her warm, dry hangar. Although Grandma’s starched cotton housedress was already severely polka dotted with raindrops, she pulled me in close for a hug. Next she set Grandpa to work drying my feet with a bath towel and hanging my slicker on the shower curtain rod where it could drain into the tub. As usual, Grandma had arranged a sampler platter with junk-food delicacies on her gold-vinyl-foot stool in the family room. She sat behind me in her lazyboy rocker drying my wet hair with a hand towel. Grandma pointed to the obligatory orange I must eat first. Grandma always pre-peeled it and wrapped it in wax paper. The orange was to appease my mother who didn’t want me filling up on junk every time I was there. Once the orange was downed, I was free to sample the finer snack foods like cheese curls, root beer and ginger cookies. “Where are your galoshes?” Grandma wanted to know. 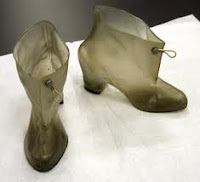 “Nobody wears galoshes in the rain, we just go barefoot.” I replied. As Grandma dug in her clothespress (her name for closet) to find some boots, I enjoyed the final pleasure of the last cheese curl dissolving in my mouth. The boots Grandma presented were made from clear plastic. Unlike Cinderella’s elegant glass pumps, these clear overshoes fastened with an elastic-figure-eight band around a button at my ankle. My naked heel fell into the pre-pressed hole that was made in anticipation of an old lady’s wide-heeled shoe. My toes wiggled up at me through the clear plastic. It never occurred to me to disobey Grandma or to fuss about not wanting to wear those things. I simply whispered a desperate prayer hoping no one would see me as I sprinted through my paper route delivering to the last 31 houses in record time. My neighbor friend and I sat on our front stoop battered and bruised from the truncated phone conversations we’ve been having with our 18-year-old daughters away at college. We shared stories of loveless phone calls that sound more like 1930’s telegram messages sent over a wire when each word cost money. When my daughter Emily came home for spring break, I sat on the closed lid of her toilet seat and began my lecture about phone manners while she curled eyelashes, plucked eyebrows and put on makeup. I employed a phrase we used in her early teens when negotiating friendly relations between our age-related cultures. I acknowledged that when Emily is communicating with those from HER country she can follow the customs of that “teen tribe.” Although they speak to one another in grunts and mumbles between incoming text messages - when she’s talking to anyone over 40 - she needs to learn the language and customs of MY people. I demonstrated the art of placing a soft and fluffy word here and there to dress up an otherwise blunt and hurtful-to-me conversation. My daughter felt it was wrong to fake cheerfulness, “Isn’t it dishonest?” she said. Right or wrong I assured her that it’s what I want. “Do it for your mother,” I instructed. I recall having similar conversations with my mom many years ago while I primped as a teenager in the bathroom mirror. From that closed-lid-porcelain-mother’s perch, I too received many important life instructions. What I call ‘faking it,’ MY mother – in HER country – called it being polite. Emily had a stomach bug while away at college and called me from her bed one night looking for comfort and joy and a bedtime story from her dear old mom. I’m not a Munchhousen by Proxy mother who gets some sort of thrill from having a sick child, but I must admit I did enjoy this brief visit to the glorious “Mommy” days. As Emily and I lay cozied up in beds 250 miles apart with phones to our ears, she gave me my requisite story characters – a dog and a ladybug and I was off! The story evolved over the next 30 minutes to one of epic-soap opera proportion. 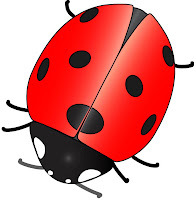 Lady, our ladybug, lost her wings in a painful scotch tape incident – narrowly escaping being wrapped alive into the colorful accoutrements of a birthday present. Bugsy, the dog and Lady’s love interest, sadly developed macular degeneration. Over their 10 years together, these 2 unlikely “love birds” came to depend on one another. Together the pair regularly watched the TV program Mystery Diagnosis hoping to discover tips that might stave the progression of Bugsy’s blindness or cure Lady’s scotch-tape-tattered wings. The story ended in dramatic fashion with Bugsy’s eyesight gradually diminishing until the only thing he could see at the center of his pinhole vision was his Lady. But after all - what’s more important to a fella than his lady? And - what's more important than a good laugh and a story when one is nauseous and miles from home.